As I reflect back at my youth at times when I didn’t necessarily take my faith seriously, Art that I once enjoyed in my youth—and still may enjoy—that isn’t necessarily Christian, or tasteful for that matter, I am having to rectify with my serious reflection on how it applies to me and my Catholic faith today. Now I can’t think, think why I should even try. Pretty Dark for a child not even able to drive. However, it’s real human emotion, it’s an experience with the dark voids of human nature that finds its source in Original Sin. Of course, some may stumble across my words and be puzzled at the expression of ‘Original Sin.’ GK Chesterton once quipped that the most striking evidence for Christianity was to view the evil in the world—cause by Original Sin. Furthermore, I once read an article about GK Chesterton that I reported asked him about what was wrong with the world to which he replied, ‘I am.” There has been a lot of great achievements in our collective human history from the idea of individual freedom; however, the idea breeds the idea of individualism in which the only thing matters is my ‘rights’ to do as I please, so to hell with anyone else. In a way, with the rise of individualism, modernity has created a cultural selfishness that becomes the antithesis of culture itself. In a culture merely rooted in “I am,” we have lost the ability to see another individual sitting beside us. If one looks at the lyrics presented by this particular Metallica song, one will notice a whole lot of “I” and “myself” in each passage. In fact, the lyricist declares “No one but me can save myself, but it’s too late.” The Christian perspective will perhaps see some of the symptoms of what is ailing this particular person. The person has turned inward towards himself as stated “getting lost within myself.” Remember in Exodus 3, God expresses his very nature as his name “I AM.” In many ways, modernity’s stress on individualism has always been rooted in the human distortion of “I am” in “The Fall” of Genesis 3—Genesis 3 and Exodus 3 coincidence? Now, of course, this doesn’t reflect fault in the lyricists, as others around him could have alienated him to where he believes “he” is his only source of salvation. Indeed, as Christians, we need to reflect on our duty to see those who are marginalized and approach them with the Gospel. Pope Francis, The Lack of Marriage Instruction, What it Means for Sin. The best way to reply to everyone’s comment’s after some thought I believe is in post format. I have been perusing through George Weigel’s new book on Pope St. John Paul II Lessons in Hope in which I was struck by a particular passage written Weigel about understanding the man and philosopher Wojtyla. Weigel writes, “There are theologians who write as if they never studied philosophy at all—and it shows, usually in confusion…philosophy is essential prerequistite to doing theology seriously…for there is no way to understand John Paul II’s magisterium—his teaching as pope—without understanding the rudiments of his philosophical position.” In light of Weigel’s point, I am really struck by his words to the point that in regards to our own discussions here, I am moved to reexamine my own life and education to understand why I have arrived to this particular conclusion. I am not a relativist, I believe the truth to be the truth; however, I do fully understand that our perceptions shaped by our environmental factors guide the manner in which we interpret the truth. Prior to my degree in history, I was a Classics major, so I do have a background in basic classical philosophy, although I have read briefly the points of more modern philosophers—unimpressed. I am reminded in my early years as a student of the famous Plato Allegory of “the Cave.” Slaves being chained to a rock; their perception of reality dictated by the darkness and the small ray of light producing shadows on the rock, and the slave that breaks free rises to the top and see the world and everything that causes the reality of the cave below. At this point, I must reject Cartesian philosophy that our experience could be nothing more than a dream state and our existence is the only sure thing we can possibly know. Dreamlike states do not follow any laws of nature and therefore do not possess the vital logical elements to come to any proper conclusion of the truth. For example, Descartes would say experience could be imagined; however, experience dictates that in we cannot dream of things or imagine them without any sort of priori knowledge of them, they must be revealed to us for ourselves to grasp them. Naturally, Classical philosophy makes clear that if one can imagine some attributes they have been observed to be true. So, the Cave example illustrates also that no matter the difference of experience—there are truths that both the slave from above and the ones in the cave can both understand. The slave that escapes understands the origin of the shadows and the cause from the sun; nonetheless, the slaves in the cave can have no such experience. However, through our human reason, the slave from above could still possess the methods to explain the concept of light by having the cave slaves manipulate the shadows with their own environment. The slave from above can also block the sun entirely during the day to exhibit that the source of light, which causes the shadows, exists somewhere outside the cave, and possibly can explain it must be its own celestial body. It may be true that the slave from above cannot explain other facets of the outside world such as the nature and essence of trees, but it is possible to explain the source of light the absence of it is darkness. Although the experiences of the cave slaves and the one from above are different—through reason—the conclusion of the truth of a source of light and darkness can still be reached by both parties. Therefore, in regards to theology, I began to reflect on Christ, other parts of the Gospels, and St. Paul’s first letter to the Corinthians. In many ways, in the Gospels, Christ asks us to become poor or like the poor. Naturally, the reason for this is because, like the outside the cave, those of us who have experienced being poor—I should preface destitute—can have absolutely no understanding of those who live these experiences everyday. Of course, these are just the passages that I’ve found briefly, but naturally, what they tell you is to either be the poor by giving up your possessions or to be around the poor by making them your guests, and thus, by doing so, you remove yourself from the cave. I will tell you that it wasn’t from sitting in class that gave me this understanding of Plato’s allegory, it was twofold, first with my new job, it forced me out into the poorest of poor neighborhoods in my community, I saw first hand what it was like to be poor in my community. All of my previous conceived ideas that I held in my ivory tower were washed away. The second is when I started a ministry for studying early church history at my parish and studied how the early Church Fathers used the philosophy of the pagans to better their own Christian philosophy by understanding that any can possess truth. So, it wasn’t until I left my cave that I began to put all of these things together. So, let us bring out the lessons of Christ in the Gospel and St. Paul in marriage while examining Pope Francis Apostolic Exhortation Amoris Laetitia to see if we find a common understanding of the truth that has been revealed to us by experiences. Now, what is St. Paul’s understanding of marriage? Advice to the Married. 1 Now in regard to the matters about which you wrote: “It is a good thing for a man not to touch a woman,” 2 but because of cases of immorality every man should have his own wife, and every woman her own husband. 3 The husband should fulfill his duty toward his wife, and likewise the wife toward her husband. 4 A wife does not have authority over her own body, but rather her husband, and similarly a husband does not have authority over his own body, but rather his wife. 5 Do not deprive each other, except perhaps by mutual consent for a time, to be free for prayer, but then return to one another, so that Satan may not tempt you through your lack of self-control. 6 This I say by way of concession, however, not as a command. 7 Indeed, I wish everyone to be as I am, but each has a particular gift from God, one of one kind and one of another. 8 b Now to the unmarried and to widows I say: it is a good thing for them to remain as they are, as I do, 9 but if they cannot exercise self-control they should marry, for it is better to marry than to be on fire. 10 To the married, however, I give this instruction (not I, but the Lord): A wife should not separate from her husband 11 —and if she does separate she must either remain single or become reconciled to her husband—and a husband should not divorce his wife. 12 To the rest I say (not the Lord): if any brother has a wife who is an unbeliever, and she is willing to go on living with him, he should not divorce her; 13 and if any woman has a husband who is an unbeliever, and he is willing to go on living with her, she should not divorce her husband. 14 For the unbelieving husband is made holy through his wife, and the unbelieving wife is made holy through the brother. Otherwise your children would be unclean, whereas in fact they are holy. Again, I agree, it is pretty straightforward, but again, remove yourself from the cave. Imagine, if your wife or husband in a valid marriage leaves you, and you are one of those who cannot possibly control your desires in which St. Paul speaks. You may have corrupted view of marriage, you may be living a life of sin by adultery or adultery through a second marriage, but it would be prudent to examine whether in this particular situation when reflecting on St. Paul’s teaching by your habits, by your knowledge, etc. whether you’re fully culpable of mortal sin in such situation. I believe to dismiss such examples, which could be very common, would be merely looking at the shadows of the cave; not listening to the explanation of light by the surface slave. Wives and Husbands. 21 Be subordinate to one another out of reverence for Christ. 22 Wives should be subordinate to their husbands as to the Lord. 23 For the husband is head of his wife just as Christ is head of the church, he himself the savior of the body. 24 As the church is subordinate to Christ, so wives should be subordinate to their husbands in everything. 25 Husbands, love your wives, even as Christ loved the church and handed himself over for her 26 to sanctify her, cleansing her by the bath of water with the word, 27 that he might present to himself the church in splendor, without spot or wrinkle or any such thing, that she might be holy and without blemish. 28 So [also] husbands should love their wives as their own bodies. He who loves his wife loves himself. 29 For no one hates his own flesh but rather nourishes and cherishes it, even as Christ does the church, 30 because we are members of his body. This particular passage was the source of sermon message at my wedding. Do our husbands have a proper understanding that our marriage must be a true representation of Christ’s love for the Church? Many get caught up on the submission of the wife in the text; however, no one bats an eye when St. Paul says the Husband must willingly die for his wife. Again, I agree the teaching is straightforward, but the first time I heard a proper teaching on this text was when I was 27 years old, I was already well into my years of discerning marriage without the proper instruction from the Church and culture. These situations must all be considered when examining a step by step resolution when solving the Church’s marriage crisis. So what about those children? Should their parents to submit to legalism? Perhaps, but it’s apparent that their parents from an early age, and I would surmise the children themselves will be, have been in a dark damp cave without the proper Christian teachings on marriage, which should have occurred throughout their entire life. And without the proper teachings, they cannot have the proper knowledge of the gravity of their actions and they certainly may not be in full possession of their will under the habit of which they should have been warned and discussed by St. Paul. Therefore, to deny these individuals of communion, is a lack of mercy to receive one who none are worthy to receive, one who may give them a proper understanding through the grace of His sacraments. George Weigel, Lessons in Hope (Basic Books: New York, 2017), 11. New American Bible, Revised Edition (Washington, DC: The United States Conference of Catholic Bishops, 2011), Mt 19:21. New American Bible, Revised Edition (Washington, DC: The United States Conference of Catholic Bishops, 2011), Mk 10:21. New American Bible, Revised Edition (Washington, DC: The United States Conference of Catholic Bishops, 2011), Mk 12:42–44. New American Bible, Revised Edition (Washington, DC: The United States Conference of Catholic Bishops, 2011), Lk 4:18. New American Bible, Revised Edition (Washington, DC: The United States Conference of Catholic Bishops, 2011), Lk 14:12–14. New American Bible, Revised Edition (Washington, DC: The United States Conference of Catholic Bishops, 2011), Mt 19:3–12. New American Bible, Revised Edition (Washington, DC: The United States Conference of Catholic Bishops, 2011), 1 Co 7:1–16. New American Bible, Revised Edition (Washington, DC: The United States Conference of Catholic Bishops, 2011), Eph 5:21–33. An issue that I have with my American Protestant brothers and sisters in Christ is a beam that I use to have in my own eye. Those in favor of originalism of the United States Constitution, Enlightenment philosophers, and the natural law that they speak, have created idols out of the founding documents, the men who created them, and the supposed “rights” which out of the Enlightenment has promoted the ideology of self-idolization in the form of “Individualism.” Of course, one can make the argument that relativism was birthed from the Protestant Reformation, given a pedestal during the Enlightenment, and now has led to secular atheism of Western Civilization as it’s logical conclusion. No doubt, some friends here will certainly disagree, but the statement must be stated regardless. We could certainly look to Locke’s anti-Catholicism or Paine’s flirtation with Atheism or pantheism at best, but instead, let’s look at Rousseau for the moment. This “enlightened” philosopher I’ve heard said by academics to be the most influential critic of Christianity at the time, who promoted the misguided philosophy of individualism. Rousseau’s basic argument in regards to religion was that one could have “spiritualism without religion,” and it’s argument that is constantly being put forth in our current times. However, a parish priest by the name of Nicholas Bergier challenged Rousseau by writing a book titled “Deism Refuted by Itself.” In the Book Fr. Bergier made clear that Enlightenment philosophers do not believe in a Biblical God but in an impersonal “nature”–hence pantheism. In the book, Fr. Bergier articulates that man cannot have just a private relationship with God outside of Government or the community in which they live because of God and later’s Christ’s covenant with mankind. 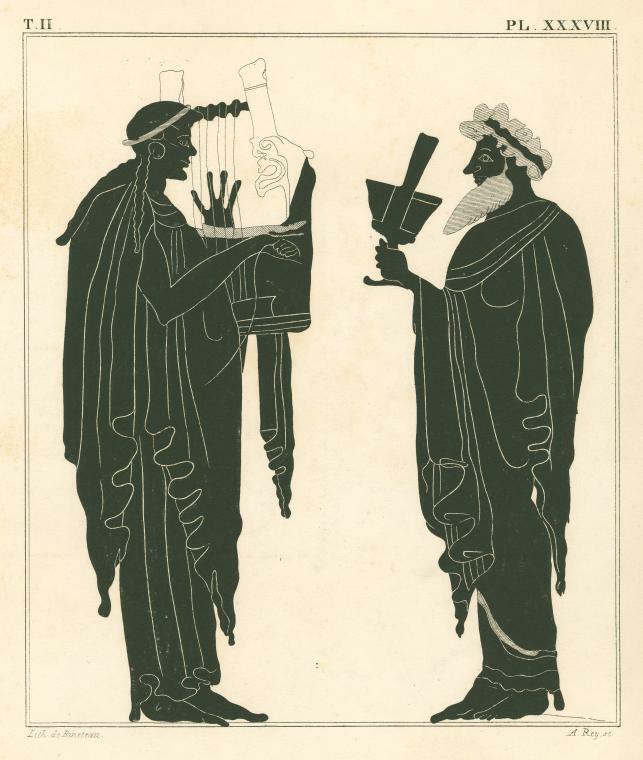 Nietzsche and Jung drew upon the characters and roles of Dionysus and Apollo to create a framework for principles of human art and behaviour.